This, my friends, is the sandwich that saved me about $30.00. Knowing my husband doesn’t usually mind stopping at the grocery store on his way home if it means it keeps us from eating out, I used that last 2 ounces of brain power I had for the day to figure out what I could have him buy that I could magically transform into a meal in a matter of minutes. And then the moment of peace washed over me as I remembered these sandwiches that I had made a while ago for a photo shoot. Oh my, they were so good! And so easy! It would be a shame to not make them again. By the time he had changed his clothes and greeted the dog and the kids (perhaps in that order) dinner was ready. The best news was… both of my kids ate it! Well… sort of. My daughter ate it and my son–picky eater extraordinaire– ate the chicken. Considering his extremely sensitive pallet, I called it a win! You seriously need to add this sandwich to your list of quick meals. Yes, you’re buying a precooked chicken but the meal as a whole still comes out to be pretty affordable. You know you’re gonna have those days, so take a little help from the store and have a delicious, quick meal… at home. This is a delicious sandwich that you can put together in minutes. Great for an easy dinner or even a picnic. 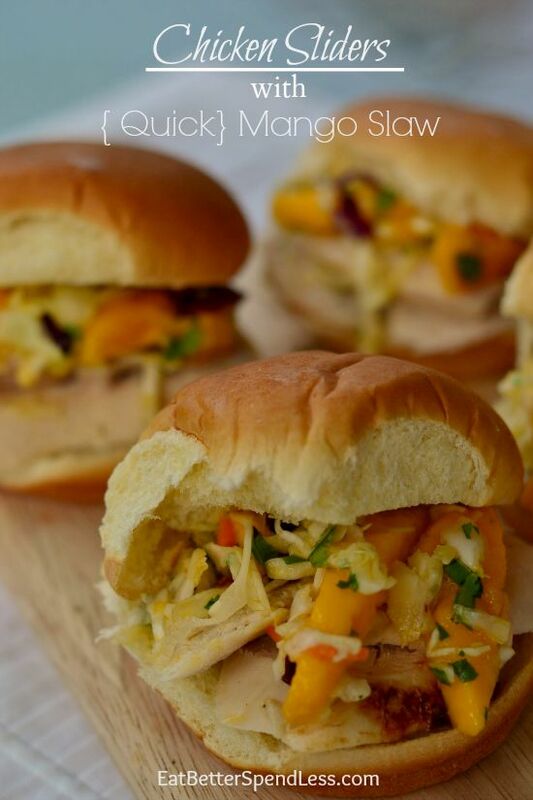 In a medium bowl, combine the mango, cilantro, coleslaw mix, olive oil and lime juice. Cut chicken into slices and put several pieces on each sandwich bun. 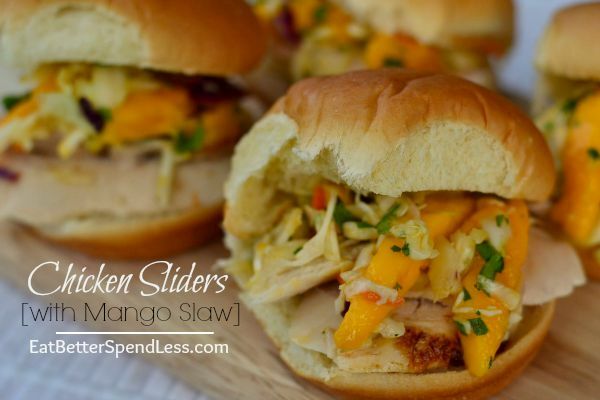 Top with a spoonful of Mango Slaw. You can make the slaw right before dinner or make it earlier in the day and chill until dinner. The flavored will combine a bit better if you make it early.